FIGURE 10-21 Anti-inflammatory action of glucocorticoid mediated by the direct interaction of N'FkB p65 and the glucocorticoid receptor. 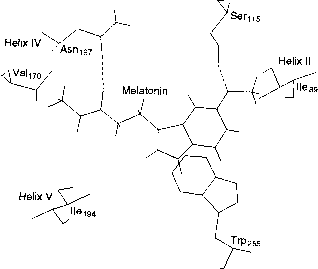 tions and the significance of amino acid residues are specified. ATPase activity. The transporting family of cytoplasmic proteins was discovered in an interesting way. 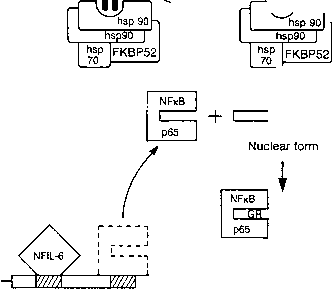 Some Japanese researchers took the SV40 T antigen sequence of the nuclear localization signal, KKKRK, and decided to prepare a "mirror image" peptide in which K's were replaced by aspartates (D) and R was replaced by glutamate (E), generating the peptide DDDED. This sequence was synthesized and an antibody was prepared against DDDED. The antibody cross-reacted with the SV40 T antigen nuclear localization signal and also with a 69-kDa protein, which was found to bind to the nuclear localization signal. These cytoplasmic proteins constitute a family of proteins that are involved in nuclear transport. FIGURE 10-22 Mode of binding of steroid receptor to inverted repeats (P3) versus the binding of the vitamin D receptor to direct repeats (DR3). The orientation of the recognition element in the major groove is implied by the arrows of the DBD. The symmetrical dimerization region of the steroid receptor DBDs is indicated by white ovals, whereas the heterologous dimerization region of vitamin D is indicated by black and white ovals. Like the vitamin D receptor, other nuclear receptors that bind to direct repeats may form analogous heterologous associations. The hormone-binding domain, which has a stronger dimerization function, may form a symmetrical dimerization interface. The two domains may be linked by a flexible tether. Reproduced with permission from Luisi, B. F., Schwabe, J. W. R., and Freedman, L. P. (1994). The steroid/nuclear receptors: From three-dimensional structure to complex formation". Vitam. Horm. 49, 1-48.